In an industry in which luxury homes, corporate campuses, and large public works projects with ample budgets take center stage in our perception of what good design looks like, it’s easy to forget that the site and landscape remains intrinsic and ubiquitous to all projects, even the small or seemingly mundane. And while as designers we may joke that only the buildings that connect with the ground need consideration for how a site should be developed, it’s indeed true that landscape affects us all. Every project deserves the value of a well-designed site. Aside from their obvious aesthetic benefits, plants can help define space, contribute to air quality, and reduce the effects of climate extremes by providing shade, windbreaks, and water absorption. Plants can be engaging, encouraging people to touch and smell, sit and enjoy, or even play a little. And for homeowners and renters alike, their ability to instill a sense of pride and well-being is boundless. Affordable and public housing is no exception, so for the urban designer for whom these projects are a staple, thinking about how to better design these landscapes for residents is a significant part of the charge. Further, housing projects are developed for their potential to strengthen communities through the physical improvement of their environments. When the public is a primary stakeholder, it’s crucial that the grounds maintain their beauty long after the ribbon cutting. - Research or visit other projects that your client built and currently maintains—even if it was designed by your own firm. Note the level of maintenance and the complexity of the design. Likely this will be a representation of what will be expected, but do note issues and failures that proved detrimental to the development as well. - Approach the project with a clear and established strategy for obtaining credits under green rating systems that are in play. Wonderfully important to gaining tax credits and other financing for a project, these systems can be a stumbling block if the requirements are too idealistic. Project team members should weigh in on the feasibility of each. Ask: Can the minimum percentage of native materials be acquired locally? Can we truly achieve the shade requirements? Would green infrastructure such as bioretention areas receive adequate runoff needed to supply its plants with vital water? - Develop a design that is simple yet elegant. Choose plants in the interest of maintenance such as compact varieties that don't need frequent shearing, shrubs and grasses that can be cut back hard when necessary, and trees that leave little mess. If irrigation is limited, specify drought tolerant materials where they are aneeded. Favor plants that more or less take care of themselves without the need for constant fertilizing, pruning, and watering, and select easy perennials that come up, bloom, and die back on their own. - Plan for wear and tear. Affordable housing can see high turnover of residents and plenty of activity. Choose durable materials and design a hardscape plan that anticipates where the most likely paths of travel will occur. Lower perennial and grass species should be “steppable” and regenerative while larger materials must not be sensitive to broken limbs or compacted soils. - Meet with the housing authority and its maintenance staff sometime during the design process to review the landscape concept. Determine if they are comfortable maintaining the proposed plants and landscape features. Discuss the level of upkeep the project will receive once warranty and maintenance periods have expired. Maintenance plans are varied from one property manager to another and understanding the client’s abilities and resources early in the design process allows for a design that will thrive versus one that will fall into disrepair. - Seek out opportunities for "pride in ownership" in which residents themselves can be involved in the project's maintenance, from community vegetable gardens to the flower beds at their front doors. Never underestimate the potential of people who are invested in the appearance and upkeep of their home and their community. - Carry out construction observation and perform punch lists. Yes, project budgets are tight at the end of a project, but the reputations of your firm, your client, and project stakeholders are on the line. Make sure the project is installed properly and is being cared for as dictated in the specifications. The goal, ultimately, is to create places that add value to their neighborhoods and inspire their communities. Developing a thorough understanding of the project’s limitations and opportunities ensures a landscape that will thrive. When designer and agency join forces to oversee the project, the interest of its long term success comes into focus and can have a profound effect on the final product. Tear out Route 315. Build a lane for autonomous cars through Olentangy River Road. Plan for a Hyperloop through downtown. These are a few of the ideas architects envision to drive Columbus into the future. Three teams or architectural firms worked with students from Ohio State University's Knowlton School of Architecture to envision how to develop the Olentangy River corridor between the school and downtown, a charette they hope will guide the future development of an area which has 23,000 residents, 59,000 students and 83,000 employees along five square miles. "We are living in a pretty exciting dynamic time of growth in Columbus," Columbus Mayor Andrew Ginther said, noting the city's anticipated population growth, which MORPC estimates will add 1 million people by 2050. "We have grown very predictably, consistently since the 1930s — we're going to grow that much in the next 20 to 30 years. Presents us with an incredible opportunity to do that differently." Their ideas, developed in a vacuum relative to projected cost, were presented to students and community leaders on campus Thursday night. But each team suggested significant steps could be taken to better connect the two major hubs of town via the riverfront. "Our histories, our past and future has been intertwined as we move forward," said OSU President Michael Drake. Framework 2.0, what OSU thinks will be the course of its growth in coming decades, looks at how people will move around and what kind of green space is needed at the school, amid the growing wave of development emanating from downtown and up High Street. "How this looked was a barrier or impediment, and we wanted to re-imagine that, particularly as we think about modern ways of moving people," Drake said. "It opens the campus to larger useful space." "Density makes the whole thing work"
NBBJ envisions the future of Olentangy River corridor and downtown. A.J. Montero, partner with architectural firm NBBJ, said existing infrastructure moves people in and out of the city efficiently. But the river is under-used and some connections between major roads like 315 and Olentangy River Road bisect the city and minimize connections between the two sides of the river. "A lot of what we have on the river is the back of something else, we need it to start being the front of something its own," he said. NBBJ envisioned straightening 315 and reworking it as a raised multi-modal corridor that loops through the city. Then it pictured re-working Olentangy River Road to carry more traffic and make room for biking and other transit, directing traffic along these corridors and away from the river. This could make room for more green space and opens up new development sites which could mean thousands of acres of riverfront land. Franklinton could be a confluence where the traffic corridors converge, and the area is imagined needing more density. The developers even envisioned where a new Hyperloop would travel through downtown and across the peninsula. "Density makes the whole thing works, density makes mass transit happen better," Montero said. The corridor today is a "relic of 20th century development patterns" with a set of non-connected road corridors, said Tom Leader, principal and founder of of TLS Landscape Architecture. He sees the corridor as a landscape problem. But the area can be modernized without removing 315 entirely. "Is it really necessary to build more roads and highways? ... We don't need to," he said. "We want to find a way to deliver a pedestrian-bike connection that can be done in five years. A transit corridor that can be done in 10. 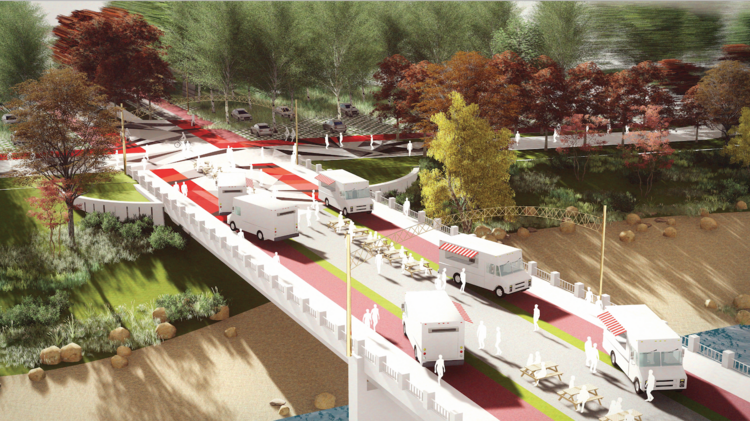 Fundamentally, the bike and pedestrian corridor can be expanded in a way that it functions in a better way." A forest corridor could stretch along the river itself from downtown to the university. 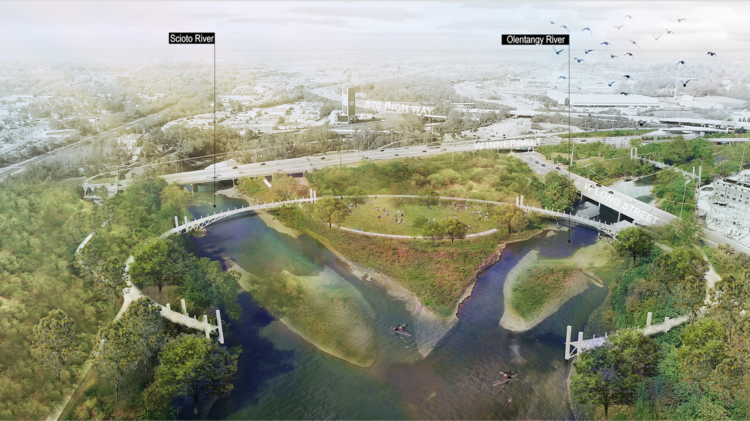 OSU could add a riverfront green amphitheater, along with walking and bike paths and connections between OSU's campus on both sides of the river. "Get people out of their cars, out to the river," said MKSK Principal Jeff Pogonis, noting the change in downtown's portion of riverfront in the past few years. A signature development could be added where the two rivers connect, like a museum or a nature park where ecology is actively managed. At that river confluence, MKSK Principal Chris Hermann suggested extending Olentagy River Road to the south, under I-670, to connect it to the Sounder Avenue-Dublin Road Interchange. 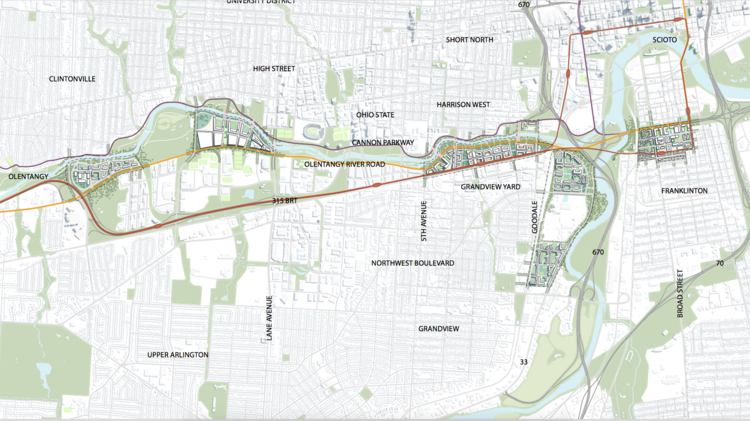 The road would be expanded with a central a multi-modal corridor with an autonomous shuttle next to Olentangy River Road that would connect neighborhoods along the river, eventually being converted to light rail. Mixed-use development would grow around the road, MKSK reasons, and allow the river area to be re-forrested for other uses, while 315 would remain, albeit with tree canopy hiding it from ground view. "Fundamentally we need to reframe the two main job centers in the city, the university and the downtown and make a connection work," said Clare Agre, principal with design firm West 8. Building "mobility hubs" that connect downtown with neighborhoods to the north, especially with bike-friendly amenities, could open up 850 acres of land along the river for green space and other uses, Agre said. "We have this sort of spaghetti city if you look at the connections (between the major roads)," said Brian Bernstein, urban designer from Realm Collaborative. "How do you think about this as a larger connector." The greatest priority would be bicycles at these hubs, with bike parking, bike ramps, and specialized corridors specifically for bike transit. The neighborhoods surrounding the loop would see the potential for growth. It's also a chance to think about new architecture and an aesthetic for the developments along what they called the "315 High Speed Corridor," which could have a high-speed bike lane as has been proposed in Miami. The neighborhoods would have a gateway to the river, and existing networks would be re-tooled where more foot and bike traffic is encouraged with the river as "one green system and network that is baked together." "It's not about the vehicle at all, it's really about the pedestrian," Agre said. Rep. Stivers Tours The Future Site of The "National Veterans Memorial and Museum" in Columbus. Our freedom comes at a price, a price that our veterans and their families selflessly pay for us. That makes it even more important to take time to honor our veterans not only on Veterans Day, but throughout the year. One way this can be done is through places like the “National Veterans Memorial and Museum” being constructed in downtown Columbus, which I have been working to support in Congress. This project, projected to open in the summer of 2018, will be the only public museum in the country that exists for the exclusive role of sharing the experiences and voices of veterans across all eras, conflicts and branches of the military. Representatives Joyce Beatty (D-OH), Pat Tiberi (R-OH), and I have introduced legislation along with the entire Ohio delegation to create a federal designation for this memorial and museum. The National Veterans Memorial and Museum will be just one more way we can honor our nation’s veterans and educate Americans about their service and sacrifice. The deadline to submit information is October 31, 2017. If you have any questions, please do not hesitate to contact my Hilliard office at 614-771-4968. Jerry Smith, FASLA of SMITH | GreenHealth Consulting and Yumin Li, ASLA of POD Design have been working together on an American-style senior living development in China. Read about their exciting new project in The Dirt. ASLA is excited to announce that the U.S. Congress heard your voices and passed H.R. 4680, the National Park Service Centennial Act. The bipartisan legislation celebrates the National Park Service's 100th year of existence and provides tools and resources to safeguard America's iconic natural and historical treasures. The Centennial bill also establishes the National Park Centennial Challenge Fund to finance signature construction, maintenance, and educational projects by matching private contributions with federal dollars. The Fund will be essential to help protect and preserve America's national parks, which are facing incredible challenges. ASLA supports the mission of the NPS to preserve the natural and cultural treasures and the values of the national park enterprise for the enjoyment, education, and inspiration of current and future generations. Landscape architects have a deep connection to our national parks and the profession played a key role in the passage of the National Park Service Organic Act, legislation that established the NPS in 1916. For the past two years, ASLA advocates have voiced strong support for passing NPS Centennial legislation, including sending thousands of messages to Congress and advocating for the issue during the annual ASLA Advocacy Days. Once again, your voice played an essential role to achieve this legislative accomplishment on behalf of NPS. Thank you for your unwavering advocacy efforts. As technological advances race onward to achieve previously unimaginable computerized applications, design professional practice laws remain conservative in order to insure the highest level of professionalism and protection to the public. Before the age of computers, traditional practice and law required crimping or signing over a design professional seal, usually with colored ink to identify an original. But paper is a tool of the past, and today’s project owners develop construction documents on computers for ease of correction and transmittal. Ohio law accommodates electronic seals, provided that an Architect follows several different sets of rules promulgated for different purposes. This article will review those provisions of law. Be A Landscape Architect is the Landscape Institute’s new look careers website. It acts as an information resource for school leavers, undergraduates, post-graduates and career changers thinking about becoming landscape architects. As well as providing details of how to study in the UK and abroad it includes inspirational content about working in the profession. The post Landscape Institute launches “Be A Landscape Architect” careers website appeared first on World Landscape Architecture. The U.S. Department of Transportation and the Centers for Disease Control are pleased to announce the launch of the new Transportation and Health Tool, which provides easy access to data that practitioners can use to examine the health impacts of transportation systems. The Transportation and Health Tool provides data on 14 transportation and public health indicators for each state, metropolitan statistical area (MSA), and urbanized area (UZA). The indicators measure how the transportation environment affects health with respect to safety, active transportation, air quality, and connectivity to destinations. You can use the tool to quickly see how a state, MSA, or UZA compares with others in addressing key transportation and health issues. The tool also provides information and resources to help agencies better understand the links between transportation and health and to identify strategies to improve public health through transportation planning and policy. Read more about the scoring methodology or download a spreadsheet with the complete dataset. The U.S. Centers for Disease Control and Prevention (CDC) and U.S. Department of Transportation (DOT) jointly developed the tool in partnership with the American Public Health Association. If you have questions or feedback about the Transportation and Health Tool, please contact tht@dot.gov. Mayor Michael B. Coleman joined today with Columbus City Council President Andrew J. Ginther, the Weinland Park community and more than 20 non-profit organizations to announce a pilot program for an urban tree nursery and to unveil a community wide effort, Branch Out Columbus, whose goal is to plant 300,000 trees throughout the city by the year 2020. For the first time in the city’s history, a thorough Urban Tree Canopy Assessment was conducted. The study was led by the Columbus Recreation & Parks Division of Forestry and prepared by consultant, Plan-It-Geo. The study shows that the urban tree canopy in Columbus covers 22% of the land, at a total of 31,171 acres. These trees provide a multitude of economic, environmental, and social benefits, conservatively valued at more than $12.1 million annually. “The City of Columbus is committed to a 27% tree canopy by 2020, but we cannot do it alone. That is why we are branching out by creating the “Branch Out Columbus” campaign calling for community wide action,” said Mayor Michael B. Coleman. An executive order will be prepared by Mayor Coleman to preserve and restore trees on all city led construction projects. To help residents on private property, through our GreenSpot Backyard Conservation Program, the City will pay up to a $50 rebate to plant native trees on their property while supplies last (currently there are enough funds for approximately 400 trees). The city, through the Recreation & Parks Foundation, has set up a fund at the Columbus Foundation where businesses and residents can donate money towards the planting of trees in the community. Mayor Coleman and residents of the Weinland Park neighborhood also announced a pilot program for an urban tree nursery. The vacant land, owned by the City of Columbus’ Land Bank and Campus Partners, on 8th Avenue near 5th Avenue will be the city’s first Urban Tree Nursery. The vision is for the nursery to be a place where trees can grow to be planted in the neighborhood and where residents can learn about the importance of trees and how to properly care for them. The Mayor announced the goal is to have at least four urban tree nurseries established in our target neighborhoods by the year 2020. Alan McKnight is retiring as executive director of Columbus’ Recreation and Parks Department after more than 38 years with the city and eight as the department’s leader. His last day will be May 31. McKnight, 61, led the department during some turbulent times as he dealt with budget cuts during the Great Recession, and was forced to close recreation centers and pools, decisions he called gut-wrenching. “Folks are very passionate about their parks and rec centers,” he said. A Leaders Roundtable on current issues and approaches in healthcare facilities planning and design, created and sponsored by Landscape Forms. The discussion included directors and administrators of three of the country’s largest medical centers, architects from international firms, architects and landscape architects from regional practices. For more than 100 years, ASLA has promoted the practice of landscape architecture and advanced the profession through advocacy, education, communication, and fellowship. ASLA members enjoy many benefits and discounts with their annual dues but the value of membership extends far beyond discounts. Joining ASLA is an asset to your professional development. Check out this video to see why you should join ASLA today! A natural approach to the problem of stormwater runoff and combined sewer overflow has been the idea of green infrastructure—systems and practices that use or mimic natural processes to infiltrate, evapotranspire, or reuse stormwater and runoff on the site where it is generated. Many regions and municipalities are working on projects right now that address the important issue of combined sewer overflow. Many older cities must reduce the amount of stormwater that overflows into their sewer lines, as mandated by the Clean Water Act. The problem with the combined system is that when the rainwater system gets overwhelmed, it can put raw sewage directly into the storm runoff receptacle. That means streams, rivers and Lake Erie are seeing more sewage than they bargained for. Landscape architects are uniquely positioned to help solve this problem. Anthony says it’s a challenge for communities to pay for these projects over a declining population base—many of which have been decreed by the Department of Justice. And they need creative ways to address the problem. Wade Trim is in the early stages of working with the Northeast Ohio Regional Sewer District on the management of its stormwater program. Green infrastructure can also be seen as a modification of a gray infrastructure: streets, roofs, parking lots, and city storm water and sewer systems. In addition to countless municipal projects underway throughout the state, one of the most recognizable examples of a green infrastructure project is at the Governor’s Residence and Heritage Garden in Bexley, which has been a showcase of sustainability for the past 15 years. The use of permeable pavers in the driveway and parking lot are a great example of green infrastructure, according to Gary Meisner of Meisner + Associates/ Land Vision in Cincinnati. Rather than water flowing quickly off of a paved surface and into the storm drains, permeable pavers allow water to flow to plant-covered ground where it can be slowly absorbed. The public funding appropriated to Transportation Enhancement projects has given landscape architecture a vibrant role in the design of streetscapes, multipurpose trails and environmental and scenic revitalization. With Ohio landscape architecture firms at the helm, local entities are getting funding assistance, design leadership and guidance to see their projects come to fruition. One of Ohio’s largest Transportation Enhancement Program projects in recent history was the Euclid Avenue Corridor Healthline enhancement in downtown Cleveland. The Greater Cleveland Regional Transit Authority and the City of Cleveland commissioned URS Corporation to conduct the conceptual and preliminary design of an improved streetscape. “It was built to enhance transit by shortening the ride, but also as an economic development tool,” said Thomas M. Evans, Manager, Landscape Architecture/Green Infrastructure Design Services at URS in Cleveland. Landscaped medians and sidewalk streetscape design improved the physical appearance of the corridor and the public transit experience. The area has seen multibillion-dollar business investments since the project was finished. URS also worked on the adjacent E. 14th streetscape, commissioned by PlayhouseSquare and partially funded by the American Recovery and Reinvestment Act of 2009 to continue the Euclid Avenue urban aesthetic. The north sidewalk was widened by four feet to allow pedestrian flow and room for outdoor cafes, and more than 100 in-ground LED lights add a theatrical feel to the PlayhouseSquare District. The Panhandle Passage Trail in Dennison, Ohio, is being developed by Akron-based Floyd Browne Group as an initiative of the Tuscarawas County Trail and Greenspace Plan. The plan will provide for a multipurpose paved trail linking the Twin Cities of Uhrichsville and Dennison along the Little Stillwater Creek Greenway. The project is aimed at stimulating tourism in a rural area as well as providing residents with green space and protection of Little Stillwater Creek. From restoration to urban growth and development, the Transportation Enhancements program provides the opportunity for innovative and constructive thinking. Ohio landscape architectural firms are playing a key role in changing and reinventing how people get to work or school, run errands and experience their everyday journeys. There have been efforts made recently by some government officials to reduce or eliminate the TE program funding. At this time, those efforts await legislative action. ASLA strongly supports the reauthorization of the TE program, as the benefits of this program provide key opportunities for both community transportation projects and landscape architects alike. The continuation of this program will allow Ohio landscape architectural firms to continue to “move” the next generation. The biggest difference between today's employment world and that of our fathers' is the rapid pace of corporate change. Expectations of company stability and long lasting employment are a thing of the past. If one isn't tuned into the signals of corporate change it can mean an unexpected layoff and months of unemployment and job searching. Do you have a career management plan to ensure your career growth in times of corporate chaos? Don't get caught off guard by holding on to a false sense of security or displaced loyalty. Those who fear change trust corporate loyalty rather than face the reality of their precarious position in the corporate food chain. Expect change and keep your eyes and ears open—or you could be the last in line when it's time to find new career opportunities. Your ability to keep your career momentum building in the midst of corporate chaos depends on your skill at adjusting quickly to change. First, don't over analyze your dilemma. Too often valuable time is wasted trying to figure out ways to make a bad situation work. Second rule, don't take it personally, or you won't be able to plan your exit strategy clearly. Third, take action as soon as possible. If your resume is kept current at all times you will be ahead of the pack when others consider moving on as well. Your resume should be updated every six months. For quick updating keep an ongoing record of your accomplishments as you overcome work challenges. Maintaining confidentiality during a job search while still employed is a challenge that requires discretion and level headedness. Ideally, no one in your company should even suspect that you are looking for other employment. Resist the urge to speak to coworkers about your decision for action. Not only do loose lips sink ships, but why put ideas in the minds of others who may become your interview competition? Keep your regular work hours and try to schedule interviews during off-work time. Avoid posting your resume online where your employer may find it. One thing that hasn't changed over the decades is the fact that a majority of people still get new positions faster through networking. What used to be called the “good ol' boy system” is as active in the job market as ever. Technology will never replace the need to be connected to a vast network of people who can help you find new career opportunities quickly. The problem is that most people ignore their network until they need it. Bad idea. If you haven't kept in touch with former coworkers how will you know how to find them when you need them? If your professional network is slim to none, get working on it right now. There are many great venues for building your network: professional associations, college alumni groups and former colleagues to name a few. Take time to meet with non-work people on a regular basis. Get to know them as friends and develop relationships built around mutual interests, friendship and trust. Make relationship building your lifelong habit and you'll never be without help when you need to make a career change. More than ever, proactive career management is essential to professional growth. Keep these rules of surviving corporate change as the building blocks of your career management plan and you'll stay in control of your professional growth and income potential. We’ve all heard stories of job candidates who looked great on paper but who were absolute disasters in person. With fewer interview opportunities available in our competitive job market, it’s essential to make the best possible first impression. Making a great first impression is easier to do when you communicate effectively with your interviewer. The best way to do this is by mirroring his or her communication style. Allowing your interviewer to set the tone of the conversation will put him or her at ease and makes the conversation flow more naturally. For instance: * If the interviewer seems all business, don’t attempt to loosen him or her up with a joke or story. Be succinct. * If the interviewer is personable, try discussing his or her interests. Personal items on display in the office can be a clue. * If asked a direct question, answer directly. Then follow up by asking if more information is needed. In my recruiting days, I abhorred over-talkative candidates, and so did most of my client employers who interviewed these candidates. Over-talking takes several forms: * Taking too long to answer direct questions. The impression: This candidate just can’t get to the point. * Nervous talkers. The impression: This candidate is covering up something or is outright lying. To avoid either of these forms of over-talking, practice answering questions in a direct manner. Using role-playing in preparing for your interview will help you avoid excessive, nervous talking. In today's job market a phone interview is the first step toward a face-to-face interview. Yet most job seekers dread phone interviews. The lack of facial cues and body language tends to unnerve interviewees. If you feel this way as well, the following tips will help you feel more in control and confident for your next phone interview. Choose your environment wisely. For best results plan to interview at home in a room cut off from kids, TV and pets. Use a good quality land line and disable phone features like call waiting. The best thing about phone interviews is that you can have as much supporting documents handy as you need. Minimally, have your resume and the job description printed out. Optimally include a list of your accomplishments that you can share. Additionally, you can have a list of answers to the toughest questions you anticipate at hand. For unplanned phone interviews, keep these documents within easy reach so that you are always ready refer to them. The toughest thing about phone interviews is the lack of physical cues, but they will be able to “hear” the positive energy in your voice when you smile as you speak. Your voice will carry better when you sit up straight, or better yet, stand as you speak. What are the most significant challenges of the position? If you don't sell yourself you won't be invited for the face-to-face interview. Specific examples are the best way to demonstrate how well you've done your job. Stories sell. Before the interview practice talking about your best accomplishments. Don't think of it as bragging. After all, potential employers are looking for people who can solve problems. If you don't tell them how you've solved problems they will never know that you are the best candidate for the job. A face-to-face interview is the goal of the phone interview. Don't be shy to ask to be included in the next phase of interviews. Let your enthusiasm for the employer and position come across loud and clear. Once you've aced your phone interview you'll be on your way to wowing them in person.